how was that previous hit not a fair ball??? At times it's like you don't know a freaking thing about baseball. Jones grounds into 4-6-3 double play. End of game. Nationals win 3-2. Called it. I was just a couple of batters early. Horrible freaking pitching from Drew. Too predictable and hittable. Thanks. You guys are the bee's knees! Thanks for play by play PC! Good. I wanted an appearance like that for Drew. Now I need him to blow one. Not as lucky as the Pirates the other night. I'm a big believer in streaks coming to an end. ...and, since nobody has mentioned the splendid 1960 Pirates lately, must note that we are coming up on the sixth anniversary of the death of Mickey Vernon, my first baseball hero, Nats 1B, two-time AL batting champ, and a player-coach with that Pirate team. I think Mickey was about 42 in 1960. Hit .293 at age 40, playing in 119 games in 1958. I remember Mickey, No. 3, Welch. We would have to go 8-0 to catch the 2012 team. This season is an unmitigated disaster. Would winning the NLDS ease the pain? Great! "We few, we happy few" who never gave up during those long as dismal years. What a pleasure to see Ryan Zimmerman get two hits in his first game back, or to see Adam LaRoche drive one into the upper deck at Miami. This team is special, in a way we dreamed about while living off the hope that Vernon or Roy Sievers and then Jim Lemon would hit home runs. Special. 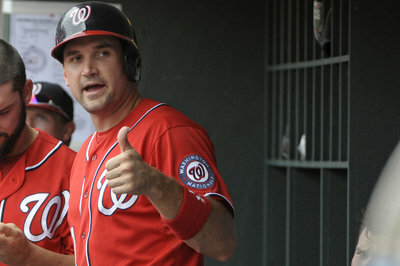 Zimmerman with a triple .